sketching sustainability – this week! 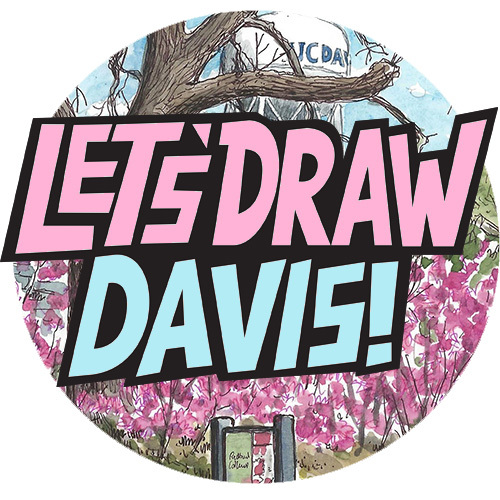 As well as the ‘Let’s Draw Davis’ sketchcrawl coming this Sunday (I’ll post the map I drew for that soon), there are a couple more sketching events coming up this week that I’m leading, both on the UC Davis campus. They are lunchtime sketching events, organized by the Sustainability folks on campus (specifically Camille Kirk) as part of the ‘Cool Campus Challenge‘. If you are nearby, join us on Wednesday April 10 (12pm-1:30pm) and Friday April 12 (12pm-1:30pm) meeting at the lobby Student Community Center, right in the middle of campus. I’ll give a few tips on quick sketching, while xxxx will talk about things to focus on that are to do with the theme of Sustainability: people riding bikes, sustainably-built buildings, recycling and composting bins, water-efficient gardens (I think they are called), that sort of thing. UC Davis is the #1 university in the country for campus sustainability (and #3 in the world). If you are at UC Davis with a sketchbook this week, and want to learn a bit about sustainability on campus, come and join us!